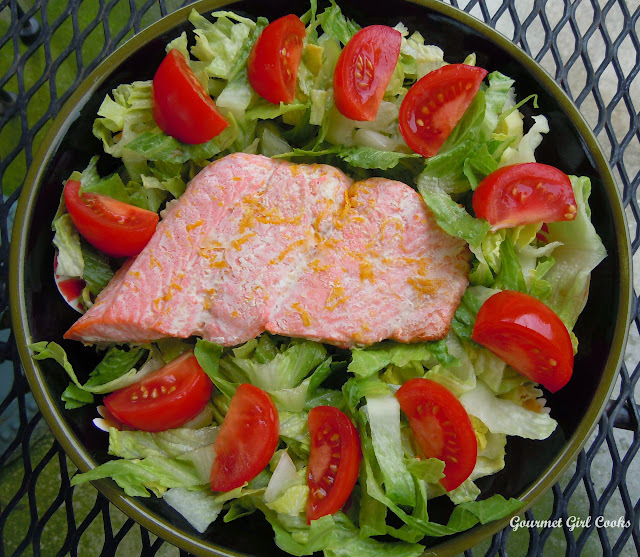 Gourmet Girl Cooks: Salmon...It's What's For Lunch! This afternoon I made myself a beautiful salad with the leftover salmon with orange butter from last night. I ate it chilled on top of a bed of freshly chopped romaine and sliced Campari tomatoes. It was simple, fresh and quick. This is the reason I like to make an extra piece or two when I cook it...because it makes an awesome lunch the next day. Oh, and my title "Salmon...It's What's For Lunch! "...is my version of the commercial for beef..."Beef...It's What's For Dinner!". They use to run that commercial all the time here! I snapped a photo of my simple salad for you to see below. Enjoy!